I find my moments of recipe creation so strange sometimes. I might go through Instagram and see what flavors inspire me, surf Pinterest to see what trends are happening... but chance are if I try to force it, it's actually extremely difficult and I get recipe block (which is the most frustrating thing ever). Recently, I'll have these moments of creative breakthrough in the most unexpected times. I was speaking in front of the Los Cerritos District Women's Club Alumnae about my new found baking life but also wanted to provide these wonderful ladies with some baked goods. For this, I knew I wanted to make something that could be done in the same morning of being served. 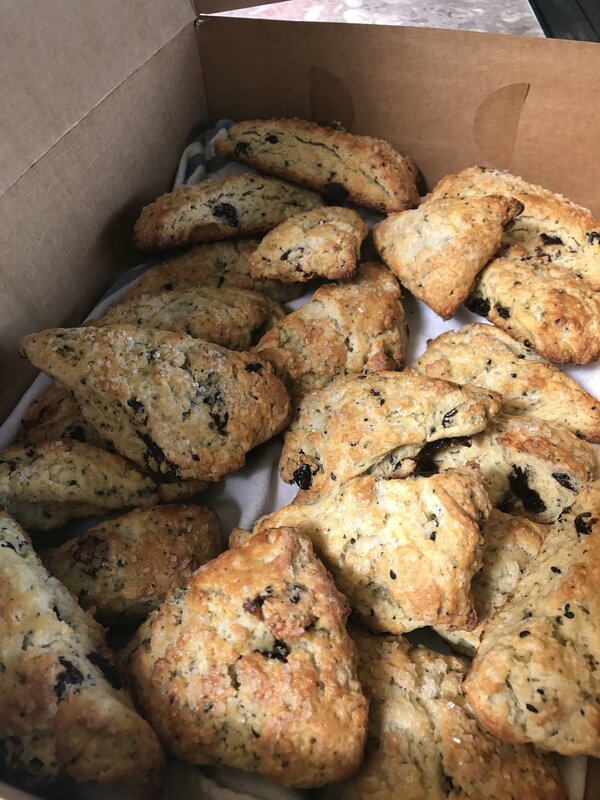 Low and behold, A SCONE is the perfect baked good that is delicious, impressive and made in the same day! Keep in mind there is some freezing time required and the longer the better but you can do a minimum 1hr before you bake and they'll still come out great. I've had some left over dried cherries from my hand pie making day and then I chose to pair it with black sesame because there's an earthy/nuttiness to that ingredient that would pair perfectly with the tartness of the cherries. I also really feel black sesame is SO under utilized in the baking world! When using cherries, I make sure to plump them up a bit in some water for 10 minutes so they aren't just a bunch of dry bits in here. I would also consider using dried currants or blueberries which I can see being sooo delish with black sesame. I'm not even a big scone eater but loveee this recipe! It's really great softness on the inside and crisp outside. Hope you guys love them too! - Remember to handle the dough as little as possible. Don't want to over exercise the gluten in the flour. - Use cold, cold butter and cold liquids! If you even have time to refrigerate your dry ingredients, do it! COLD EVERYTHING is the key to fluffy and flakey scones! - Freeze your cut scones for at least 1-2 hours before applying your wash and baking. You want these babies practically frozen before going into the oven. 1. Prep your cherries by covering with water and letting them soak for 10 minutes. Grind your black sesame into powder if needed. Prep 1 large baking sheet with parchment paper and lightly dusted with flour then set aside. 2. In a large bowl, add flour, sugar, salt, baking powder, black sesame powder and black sesame. Whisk together to incorporate. If you have time, place the flour mixture into the fridge for at least 20-30 minutes to chill. If you don't have time you can skip this step just work quickly. 3. Add in diced butter to the flour and rub the bits of butter with the flour until it becomes a very rough and crumbly mixture. There should still be bits of butter showing. 3. Remove cherries from the water and lightly pat with paper towel just to remove the excess water. Fold them into the flour and butter mixture. 5. Take the dough and scrape onto the baking sheet with parchment paper. Add more flour as needed if it's too wet to handle. Separate the dough and using the heel of your palm shape into two discs next to each other. Each disc should be about 3/4 of an inch thick. 6. Using a bench scrapper, cut each disc into 5-6 wedges then pull them apart so they sit at least 1 inch away from each other. Place into the freezer uncovered for minimum of 1.5 hours before baking and up to 1 month. 7. Preheat oven to 425 F. When oven is ready, remove scones from the freezer and apply a quick cream/milk wash. Sprinkle with sparkling sugar. 8. Bake in heated oven for 20-23 minutes. The thicker the scone the longer they'll take. Rotate the pan at least once when 75% of the time has passed. Scones are done baking with the outside is golden brown and can lift off the pan. 9. Remove scones from the oven and cool for 1 minute on the pan. Transfer over to a cooling rack and serve immediately! These puppies are the best straight from the oven or if you want to save them make sure you reheat before eating.